Land improvement and maintenance are frequent concerns of commercial and municipal entities but the specifics of concrete development are rarely focused on directly. Things like paving, edging, drainage and pathways are the first items that quickly come to mind but extruded concrete curb and commercial extruded curbing less so. 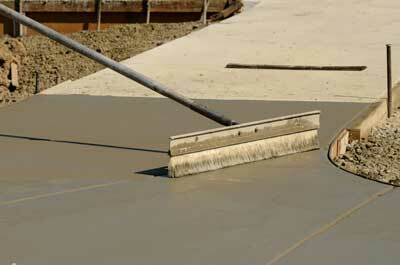 Our concrete artisans are curb experts who install concrete curbs frequently. Just like there are different types of construction and maintenance considerations for buildings and easements, there are many considerations thoughtfully implemented in edging and curbs of roads, walkways and meridians. Details pertaining to extruded concrete curb development and commercial extruded curbing include items like curb height, bonding strengths and direction of force upon impact. 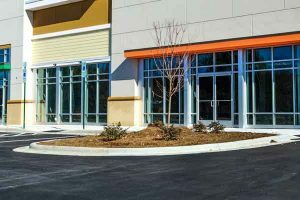 It is a certainty that a heavy weight is going to come down on or skid against a curb, which is why a knowledgeable contractor is a necessity for commercial and municipal land development. Commercial and municipal properties often see heavy traffic and things like longevity and appearance are important to providing functional, safe accessibility to the public while retaining a professional and appealing exterior. Extruded concrete curbs are created through the use of concrete mixtures shaped by a machine and bonded to the existing ground material. The height of the curb assists the direction of force and modifies the impact and direction of the incoming force. A shorter curb, for example, can provide a sturdier structure that when impacted by the tire of an automobile does not shear as well. This protects the integrity of the existing land development. Materials used in commercial extruded curbing determine if the curb will break and how it will break. Some individuals want a length of steel wrapped in the curb’s exterior concrete shell to provide further reinforcement to the curb but are unaware of how the steel can transmit the impact of force along its whole length causing structural weakening in the whole of the curb rather than retaining the force at the site of impact as a non-steel curb would. Extruded concrete curbing seems a simple development but there’s much more to implementation of the curb than setting down a lump of concrete. Even though it’s simple to lay 2,000 feet of curb in a day with a powerful efficient machine and skilled workers, the experts at our company work for the client’s best interest at the direction of the client’s plans and needs.